Located in Tokyo’s Marunouchi Ward , the Tokyo International Forum was opened to the public on January 10th , 1997 . The majority owner of the company administering the Tokyo International Forum is the Tokyo Metropolitan Government . It was designed by Uruguayan architect Rafael Viñoly , and it was built at the former site of the Tokyo City Hall ( before it was moved to the Tokyo Metropolitan Government Building , in Tokyo’s Shinjuku Ward , in 1991 . The closest train station is JR Yurakucho station , though it can accessed from JR Tokyo station through an underground passage . The Glass Hall building features swooping curves of steel truss and glass ; it’s exterior is shaped like an elongated boat . Conference rooms are located on the Yurakucho station side of the Glass Hall . There’s a ramp running clock wise on the sides of the Glass Hall . Through this ramp it is possible to access the top floor of the Glass Hall . There are foot bridges connecting this ramp , the adjacent events halls building and the conference rooms . Beware if you’re going to take pictures inside the Glass Hall , as it is a functioning business building . Tripod use is only possible with prior authorization . Depending on the conference rooms usage , there are times that access to the foot bridges is restricted . 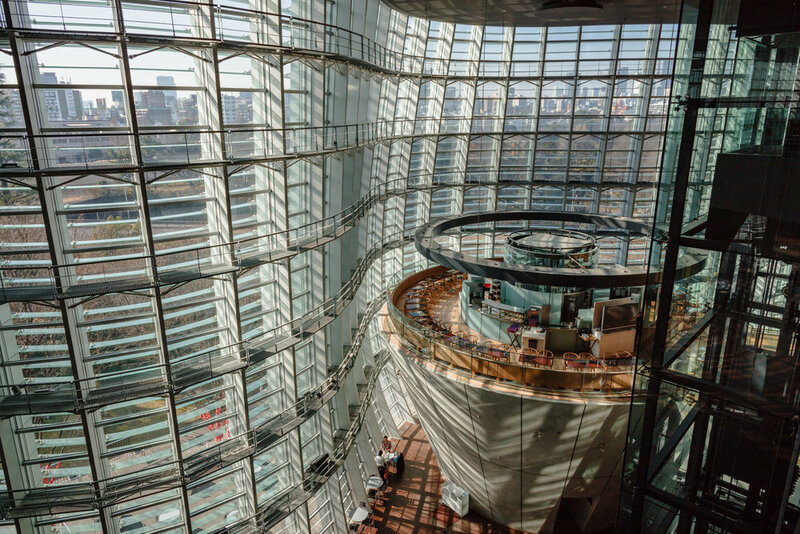 The National Art Center , Tokyo , is a museum located in the Roppongi district of Minato Ward in Tokyo . The building was designed by Japanese architect Kisho Kurokawa . It was opened to the public on January 21st , 2007 . Unlike Japan's other national art museums, NACT is an 'empty museum', without a collection, permanent display, and curators. Like Kunsthalle in German-speaking regions, it accommodates temporary exhibitions sponsored and curated by other organizations. There’s a direct access , exit number 6 , from Nogizaka station , on the Tokyo Metro Chiyoda Line or you can walk from Roppongi station , either on the Tokyo Metro Hibiya Line or Toei Oedo line . The museum is adjacent to the National Graduate Institute for Policy Studies and close to the Tokyo Midtown shopping complex and the Tokyo Ritz Carlton hotel . The museum is closed every Tuesday . The curved steel and glass exterior is a distinctive feature of the museum’s architecture . Another distinctive architectural feature of the museum is the restaurant / cafe area situated close it’s entrance . There are 2 inverted cones in which are situated the Café: Salon de Thé ROND , on the 2nd floor , and the BRASSERIE PAUL BOCUSE Le Musée , on the 3rd floor . With citations from Wikipedia . Once I saw an online article in Japanese about Tokyo Station’s Dungeon . 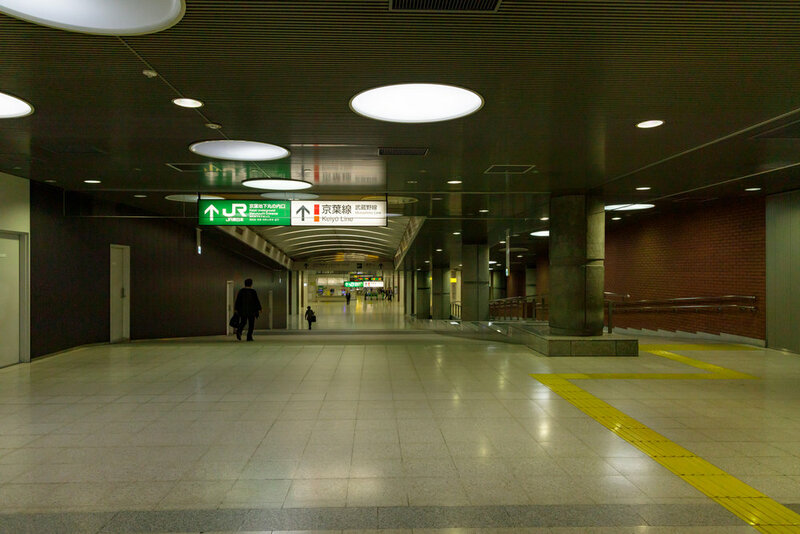 The title of this post might be a bit odd , but in reality it is about the underground passage from Tokyo Station to the entrance of the JR Keiyo Line Tokyo Terminus . The JR Keiyo Line Tokyo Terminus was opened in March 1990 , so it is newer than the other stations across Tokyo . The JR Keiyo Line is the train line that links Tokyo to Tokyo Disneyland and Makuhari Messe , both in Chiba Prefecture . This underground passage is also a way to go from Tokyo Station to the Tokyo International Forum on foot without the inconveniences of the outdoor weather . It is a 15 to 20 minutes walk from Tokyo Station to the Tokyo International Forum . Tokyo Station , basically faces either the Marunouchi District or the Yaesu District . Tokyo Station has several entrances . The closest one to this underground passage is the Marunouchi Underground South Gate . Beware that this is an unmanned gate , with only automatic gates , if you’re using the Japan Rail Pass you might need to exit at the Marunouchi Underground Central Gate . You can easily find the beginning of the passage by looking for the train wheels monument close to the Marunouchi Underground South Gate . Past the train wheels monument go to entrance to the underground passage , which the red lights in it’s columns . Not to the left . Straight ahead . The JR Keiyo Line is color coded in red , hence the red lights in the columns . Through this corridor , down the stairs . Almost there . Down the slope . Another view of the slope . Before you get to the gates of the JR Keiyo Line , to your right side is the entrance to the Tokyo International Forum . Entrance to the Tokyo International Forum . Street Level entrance to the passage at the Tokyo International Forum . 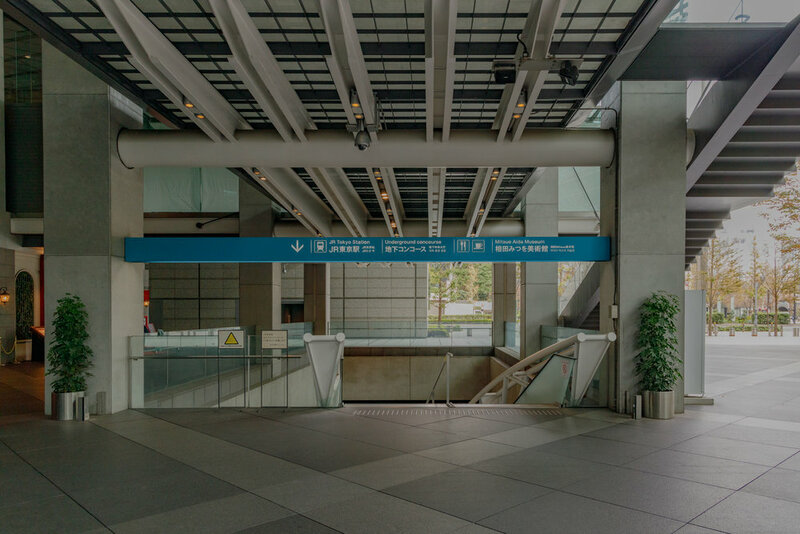 At the Tokyo International Forum , it is possible to access the passage either through the entrance at street level or at the underground entrance . Underground Entrance to the passage at the Tokyo International Forum . At the Tokyo International Forum , the underground entrance to the passage is close to the Mitsuo Aida Museum . My advice for a one day trip to Iwakuni City in Yamaguchi Prefecture would consist of sightseeing the Kintai Bridge and Iwakuni Castle in the morning time and doing a factory tour at Asahi Brewery of Dassai Sake fame . Here's a YouTube video of the Brewery tour , though the actual tour is not like the video , it's much shorter and basic ( Visitors are not shown the Koji Room ) . What is shown in the Brewery Tour is the new 10 stories Brewery . You're taken by elevator to the 10th floor where the already polished rice is washed and prepared for cooking . Then you're taken downstairs through a flight of stairs to the refrigerated floor where there are huge fermentation vats with what is to become Dassai Sake . At the end you're shown a short video in a conference room . The actual tour might not be as interesting as the YouTube video , but the chance to feel the fruity vapors emanating from the fermentation vats is an interesting experience . Things to take in consideration when visiting Iwakuni City . It's more convenient if you take a taxi from the train station to the Kintai Bridge . The Dassai Brewery is situated very into the mountain side of Iwakuni City . The afternoon Brewery Tour begins at 2:00 PM . It's recommended to take a taxi to Iwakuni station ( not Shin Iwakuni station ) after visiting the Kintai Bridge . From Iwakuni station take a train to Suo Takamori station on the Gantoku Line . From there take a taxi to the Asahi Brewery ( about 15 minutes ride from Suo Takamori station ) . For the Brewery Tour you'll need to make a reservation with at least 1 week in advance through this web form . The Brewery Tour schedule for the weekends is quite busy . Only 5 participants ( ages 13 and older ) are allowed per tour . The cost of the tour is 200 yen per person , covering the cost of the lab coat and cap to be worn during the tour . After the tour it is possible to do a tasting session of the Dassai Sake at the nearby Dassai Brewery store . The cost of the tasting session is 300 yen per person . Asahi Brewery will try to arrange an English speaking guide for the tour , but it is not guaranteed . The prices at the Brewery store are cheaper than what you'll find at Japanese liquor stores . Iwakuni Castle is situated at the top of the mountain . To get to Iwakuni Castle you must take the Cable Car .To get there , first cross the Kintai Bridge towards the mountain . After passing by some local stores , Kikko Park with it's fountain and Iwakuni White Snakes Museum you'll find the Cable Car station . You're advised to buy the set ticket when crossing Kintai Bridge . The set ticket costs 940 yen and covers the Kintai Bridge crossing fee , the Cable Car fee and the Iwakuni Castle entrance fee . The Chinese Fortune Cookies that can be had all over the World , except in China and Japan , at Chinese Restaurants , are really Japanese Fortune Cookies . You can read more details in this Japan Times article . Or can watch this Adam Ruins Everything short clip on the matter . I was able to find two shops selling the Japanese Fortune Cookies ( Omikuji Senbei or Tsujiura Senbei ) around Kyoto's Fushimi Inari Taisha Shrine . Matsuya is close to Fushimi Inari Station on the Keihan Main Line . Matsuya has a web site and it is possible to order the cookies through the site , though it is all in Japanese . Matsuya is open from 8:00 AM until 6:00 PM . The other shop I've found is Souhonke Inariya , mentioned in the Japan Times article . Souhonke Inariya is located adjacent to Fushimi Inari Taisha Shrine . It is open from 8:30 AM until 5:30 PM except on Thursdays , when it is closed . The Fortunes inside the Cookies are written in Japanese , though at Souhonke Inariya it is possible to place orders for Cookies with the Fortunes written in either English or Chinese . The main ingredients in the making of the Japanese Fortune Cookies are : Flour , Sugar , Miso Paste and White Sesame Seeds . 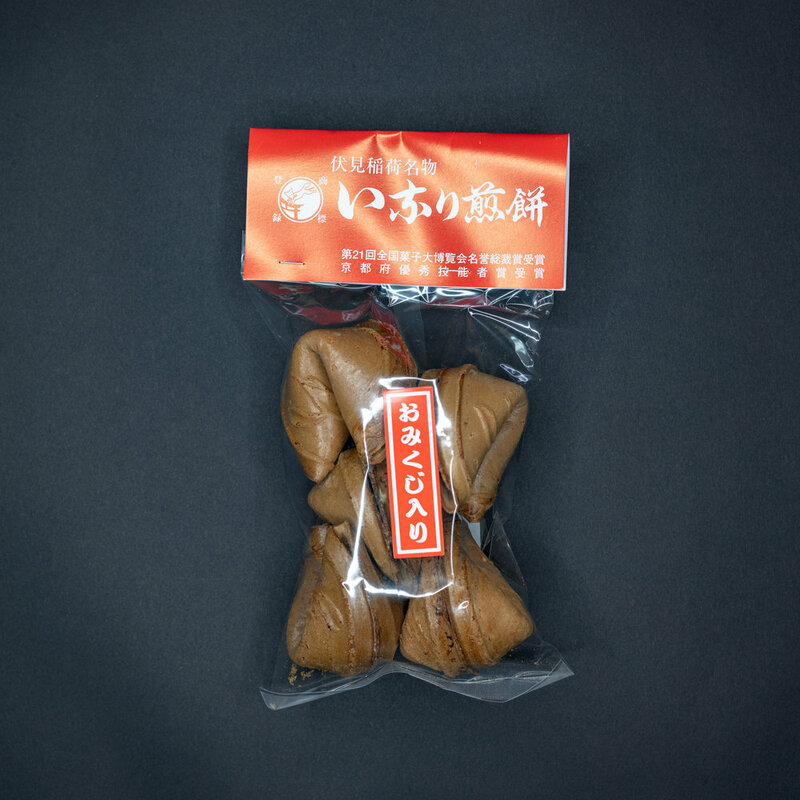 Matsuya has a new version of its cookie in which Ginger is added giving a spicy flavor to the cookies . The cookies can be bought in packages of 5 or 10 cookies . They cost the same price at Matsuya and Souhonke Inariya , which is 450 Yen for the package of 5 cookies and 900 Yen for the package of 10 cookies . 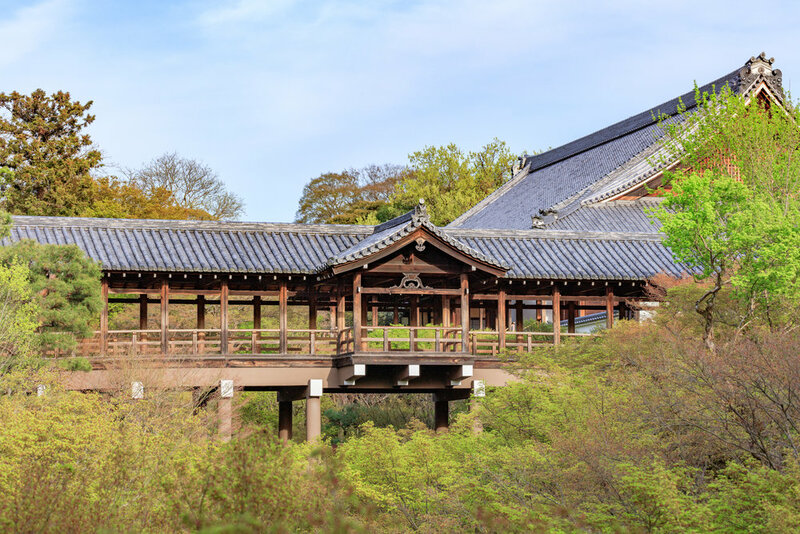 Most people when visiting Tofukuji Temple's famous Moss Garden usually look down from the balcony and take pictures of the Moss and the square rocks , the usual Moss Garden Picture . But there is a small interesting Heart shaped bush , close to the Tea Room . Looking from the Balcony , the bush is at your left side , in the direction of the Tsutenkyo Bridge . I didn't noticed it until a Securit Guard showed it to me . It was quite a surprise because the said Heart shaped bush is not hidden , it is standing there in plain sight .